Building, developing and managing commercial real estate isn’t without its challenges. How can building owners reduce the traditional costs of operation, stay competitive, and keep their buildings occupied? To more efficiently and profitably manage properties while also raising tenant satisfaction, consider turning your facilities into “smart” buildings. 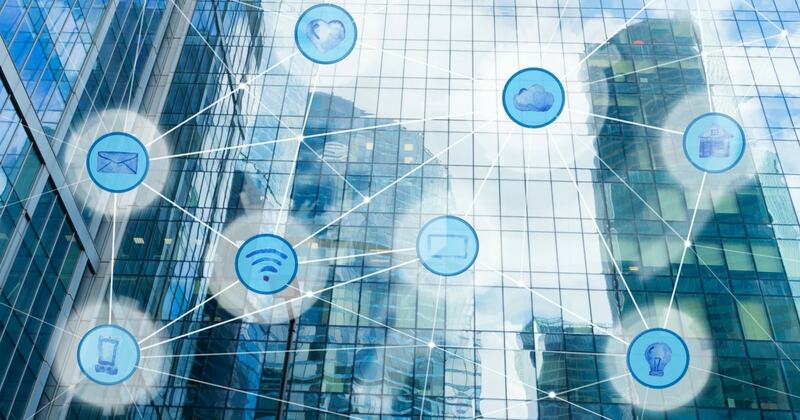 Putting the Internet of Things (IoT) to work in commercial buildings enables the delivery of new user experiences and improves efficiency and sustainability while providing significant energy savings. Smart buildings improve property management by delivering real time information on utilization and occupancy, while combining multiple building systems into a network that is easy to manage and maintain. IoT solutions accomplish this feat by merging lighting, air, physical security and other systems onto a single management network that can track key activities and functionality. All of this information is communicated in real time back to a central monitoring system for one building or hundreds of buildings. Customer Experience – Workers can personalize their work environment by adjusting lighting, color and temperature to suit their preferences. These settings follow them to their work spaces. All tenants can take advantage of improved comfort, safety and productivity. Proactive Maintenance – In building maintenance, surprises are costly. If the entire air conditioning system breaks overnight, that’s a big deal. A plethora of city ordinances and state statutes across the country require commercial facilities to provide key services, like a climate-controlled environment. When there’s an outage, the building manager has to correct the situation within a set time frame or risk paying a penalty. By being alerted to technology health issues long before systems fail, commercial real estate facilities can proactively address issues at a much more reasonable cost. Lighting – New lighting fixtures use Power over Ethernet (PoE) technology instead of traditional wiring. Ethernet cable is easier and faster to deploy than electrical conduit, and wiring costs are lower. And when you need to move a light, you don’t need to call an electrician. It’s easy to make changes with just a simple software action. Energy Efficiency – Allowing building systems to “speak” to each other over the network can deliver significant energy savings. Sensors can be placed in conference rooms to detect when more people enter the room. These sensors can alert the HVAC system to pipe in more cool air only when it is needed. Consider that 40% of a building’s operational expense is keeping the lights on. Daylight harvesting can utilize ambient light in a room to reduce lighting costs and switch off lighting when a space is not being used. IoT solutions can give property managers the visibility and control needed to monitor and maintain every aspect of a building’s health. This ensures problem areas are identified and addressed before they put profitability or tenant satisfaction in serious jeopardy. If you want a faster time to market and the ability to deliver personalized customer experiences that drive loyalty, consider Smart Building solutions. You can position yourself to build and manage your commercial properties more profitably by working with a technology partner that can help develop and implement innovative IoT solutions. InaCOMP works side-by-side with leading manufacturers like Cisco to develop end-user solutions that drive business impact. Gartner says more than half of major new business processes and systems will incorporate some element of the Internet of Things (IoT) by 2020. With IoT being so new, it can be difficult at times to understand where your business fits in. Leverage a partner (like InaCOMP) to see where IoT fits into your commercial real estate construction and development strategy.